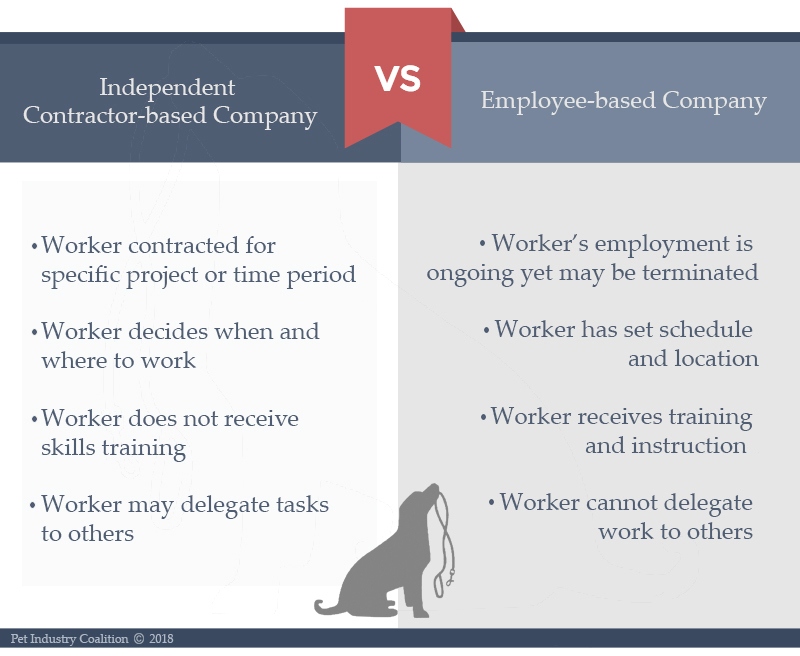 Hiring Companies with Employees versus Independent Contractors. Have you ever considered the framework of how a dog walking or pet sitting company operates or how it trains its new hires? Have you thought about how it treats its people to ensure happy, healthy, and invested service providers are entering your home to work with your pet? A key ingredient in the quality of service a pet care company offers is its choice to hire employees or outsource work to independent contractors, and it’s something pet owners should seriously consider before hiring. As a pet owner, why should you care? Between on-demand dog walking apps with flimsy training practices and a laundry list of horror stories, to companies who choose to evade the law of paying employment taxes, unemployment and workers’ compensation to fatten their bottom line, the reasons are compelling. Let’s take a closer look at the critical differences between a company that contracts with independent contractors vs. a company that hires and retains employees. Rover-Time is proud of the strong workplace we’ve created by employing its entire team. We do not use independent contractors for everyone’s safety, yours and ours. In the comments, let us know your questions. We’re happy to help! I totally agree when you said that it is important to be aware of choosing the right person or company to keep you and your pet from experiencing any horror stories. I will definitely choose carefully when hiring a pet sitter because I am at work most of the time which means that my dog will be handled by a stranger for a long period of time. My dog is a small kind of breed that is why it can't be left alone for long. Thanks!